RIM isn't usually one for revealing long term plans, but a pair of recent patent applications from the company look to at least give some indication of where the company may be headed with its beloved Blackberry (don't worry, they all still have keypads). The first and more recent of the two is the one you see sketched out above, described by the company simply as a "mobile device with rotatable keyboard." That bit of innovation means that means that the jumble of letters and digits you see on the keypad up there will line up to suit how you're using the device, with the numbers legible in flip phone mode, and the letters readable with the keypad swung out for some serious text-entering, also providing a bit of added comfort. 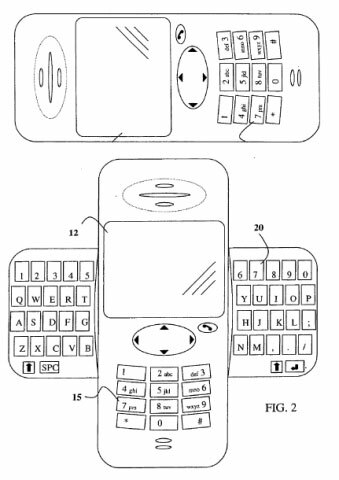 The second patent filing (seen after the break) takes the dual keyboard concept one step further, with a standard numeric keypad on the face of the device and a full-on QWERTY keyboard hidden on the back of the handheld that can be flipped out when needed. Of course, these being patent applications, there's not telling when or if either of them will actually make it to market, so don't get your hopes up too much.